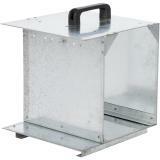 Sits on the ground—less risk of damage from vandals, snow, rain and livestock. 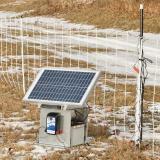 Makes moving the energizer, battery, and solar panel from place to place easier by consolidating them into one unit. 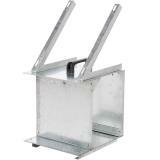 Hang the battery energizer on the threaded bolt at the front of the support box. Make sure bolt is tightened in place (not loose). The box is pre-drilled for Premier brand solar panel brackets. Insert these into the top of the case and thread nuts onto bolts. Attach the panel to the brackets. The battery sits in the center compartment. Attach the battery to the solar panel (for recharging). Orient the unit so the panel faces due south. 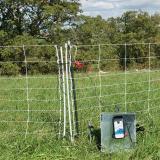 When the fence is ready to be energized: connect the energizer to the fence, ground rod and finally the battery. If buying to use with another brand of energizer or solar brackets. 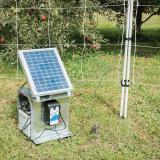 0.5 joule output electric fence energizer for powering livestock and garden fences. Excellent for up to 5 rolls of electrified netting. This 110v AC or 12v DC electric fence energizer will automatically adjust draw down as much as 80% if the fence isn't touching green weeds. Very happy with this purchase. I bought the energizer, support box, solar panel and brackets. Premier put it all together before shipping! All I had to do was buy the battery and use the pre-wired clamps to attach it. I have the smaller panel (10 watts) and the speedrite energizer, and I have no problem at all moving it around. And I bought the large marine battery. I can see where maybe a bigger solar panel might hinder carrying it, but mine is perfectly fine. Does the job, but very awkward to move with a solar panel attached since the handle is underneath the panel.